In a skillet over medium heat, brown the lean ground beef (or ground turkey). Mix in the taco seasoning & water. Cook over medium heat another 10 minutes (until most of the water has dissolved). Add the can of re-fried beans, stir until well combined. Remove from heat. Preheat the oven to 375 degrees F. On a floured surface, using a rolling pin, roll each biscuit into thin 6 inch rounds. Roll all biscuits out before proceeding. Place 2 tablespoons of filling and sprinkle a little cheese into the center of each round. Fold in half and press closed with a fork. Pierce the top of each empanada with the fork for the steam to escape. Bake the filled biscuits 1" apart on a baking sheet for about 14 minutes until golden brown. 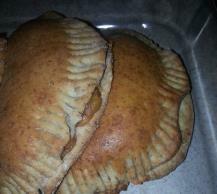 Remove from oven and brush each empanada with melted butter, bake for an additional 6 minutes. Remove from oven and brush with butter once more. Let cool 10 minutes & ENJOY!